Carefully cut the tops of all of your easter eggs (using a sharp knife) and set them aside to fill later. In a mixer, add your cream cheese, yogurt and sugar and beat on a medium-high speed until smooth. While your cream cheese mixture is beating. Place your 2 tbsp of water into a small microwave safe bowl and sprinkle your gelatin on top. Leave to soak for ~30 seconds and then microwave your gelatin mixture for 10 seconds, stirring your gelatin to ensure everything is dissolved. With your mixer running on a low speed, add your vanilla and gelatin mixture to your cream cheese mixture and mix until combined, scraping down the sides to ensure everything is incorporated. To fill your Easter eggs, either spoon your mixture into each egg - or fill a piping bag or ziplock bag with your mixture, snip off one end and pipe your mixture into each egg, filling them almost completely to the top. 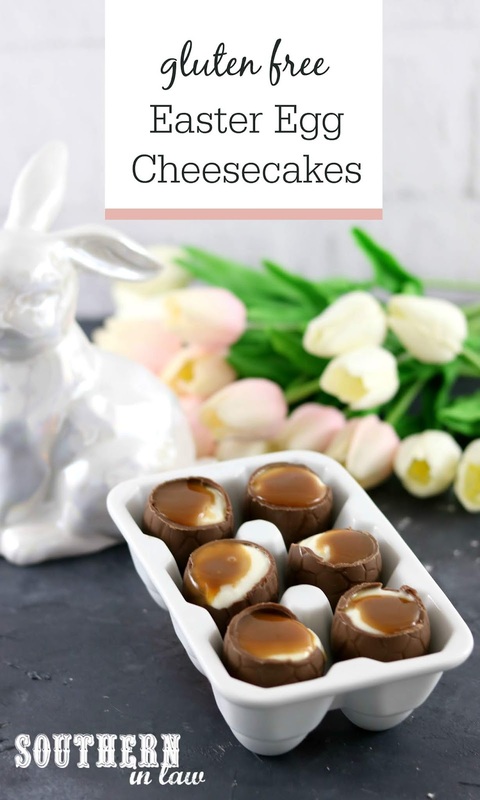 Once all of your eggs have been filled, place them into the fridge to chill and set for 1-2 hours or until your cheesecake mixture is chilled and firm. 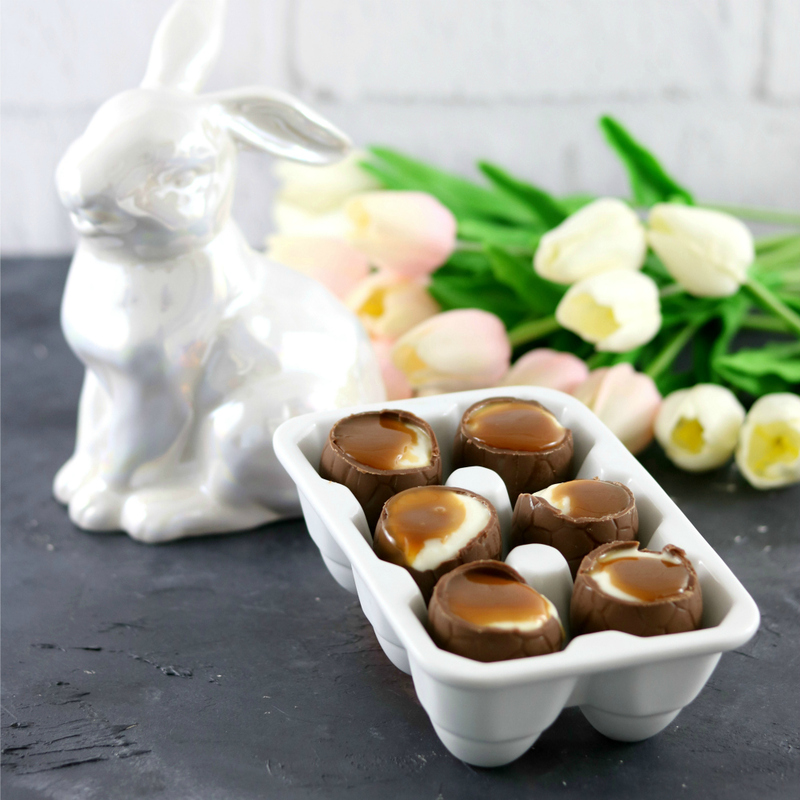 Just before you're ready to serve them, dollop a teaspoon of the caramel onto the top of each egg. *I've used both spreadable reduced fat cream cheese and full fat brick style cream cheese and both have worked fine! **Don't like yogurt? You can swap it for the same amount of cream cheese (using a total of 2C) or use 1C thickened cream and add an extra 1/2 tsp of gelatin. 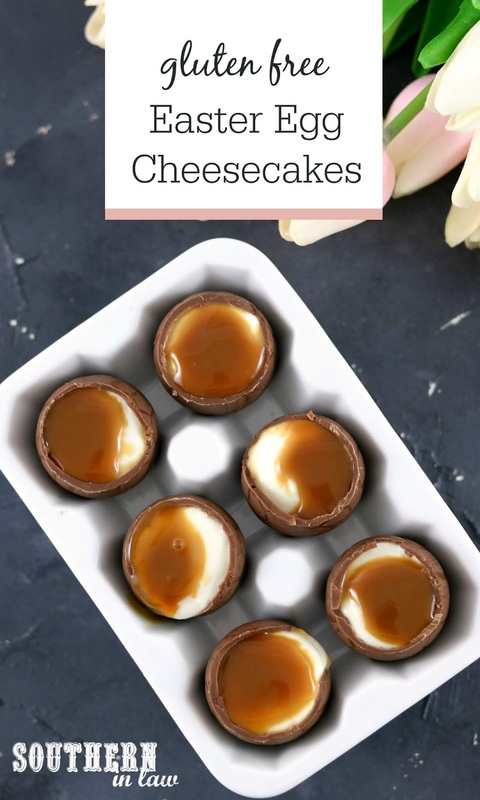 If you're making these cheesecakes ahead of time, do everything but add the caramel - and add the caramel just before serving. You can add the caramel in advance but we've found it tends to go a little bit runny! We have a very busy weekend planned - but Jesse seems to be coming down with the flu so I am loading him up with all the flu-fighting things and hoping we don't all end up sick!